I juggled at the Murchison Middle School fall festival last night. It was fun. This is the second time I've done this event. Since the majority of my shows have been for elementary-aged kids, it's interesting to see how older kids react. One big challenge at this event, and events like it, is the noise. I like to do patter, and patter gets destroyed by the background noise at a thing like this, unless you have a microphone, and I don't, yet. I plan to go that route eventually, but right now my act uses no electronics, and it's hard to resist that simplicity: I can show up at a place and open my trunk and get started, with no setup. The older kids like my material just fine, but they show a much greater interest in trying things out. 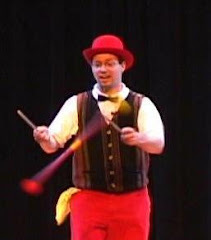 I spent a lot of time teaching half-juggling and plate spinning.